A second prison employee has been arrested in connection with the escape in New York state of two convicted killers who remain on the loose after nearly three weeks. 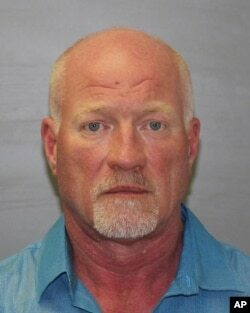 This photo provided by the New York State Police shows Gene Palmer, who was arrested on suspicion of having assisted the escape of two inmates from a Dannemora prison, June 24, 2015. Gene Palmer, who worked at the Clinton Correctional Facility, from which the pair fled, allegedly helped smuggle tools and other contraband in frozen hamburger meat to the inmates, Richard Matt and David Sweat. Palmer, 57, is charged with promoting prison contraband, two counts of tampering with physical evidence and one count of official misconduct. He was taken to court late Wednesday for an arraignment. Another prison employee, Joyce Mitchell, was charged with facilitating the escape. She also was accused of smuggling hacksaw blades and drill bits to the pair in raw hamburger meat. She has pleaded not guilty. Matt and Sweat cut their way out of their cells at the maximum-security prison in Dannemora, New York, on June 6, sparking a massive manhunt. More than 1,000 U.S. agents have been tasked with finding the escaped inmates.